Panel defines report files generated during session. 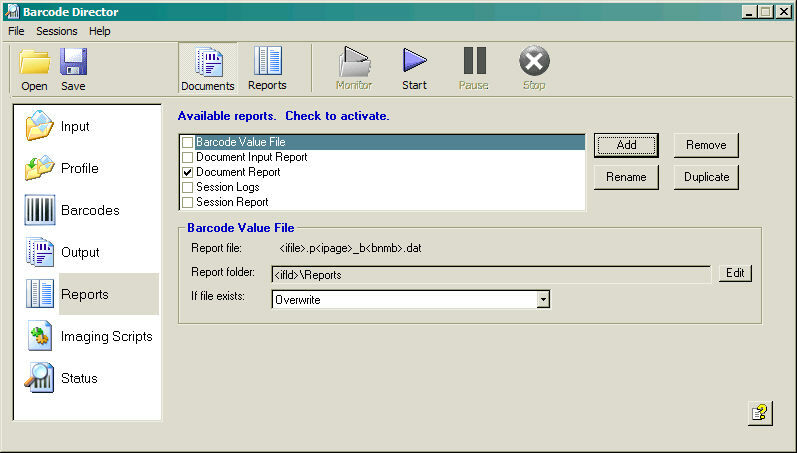 Available report types depend if program is in Documents mode (as shown below) or in Reports mode. List reports which type and parameters defined by the user. Only reports with a check mark to the left are produced during session. Created by clicking Add button and specifying report name and parameters. Deleted by clicking Remove button. Selected report is deleted. Renamed by clicking Rename button. Selected report is renamed. Duplicated by clicking Duplicate button. Selected report is duplicated. User is prompted for new report name. Selected report parameters are copied to the new report. Activated by checking box next to report name. Only active reports are generated during session. Deactivated by unchecking box next to report name.